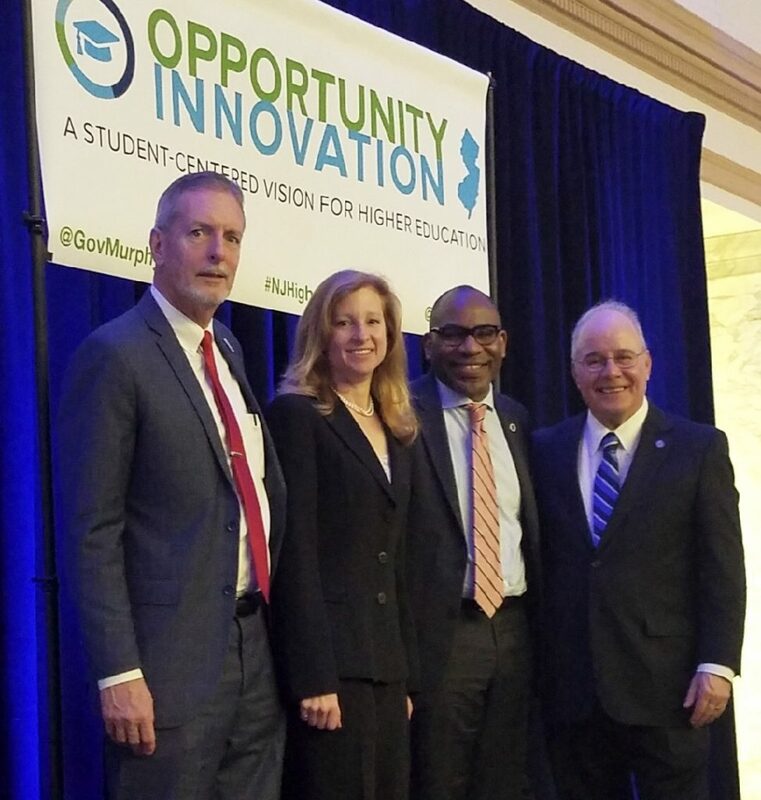 Pictured from left to right: Donald A. Borden, President of Camden County College; Laura Overdeck, Founder of the Overdeck Family Foundation; Reginald Lewis Executive Director of NCLC; and Harvey Kesselman, President of Stockton University. Executive Director of the Newark City of Learning Collaborative (NCLC) and ACNJ board member Reggie Lewis was named co-chair of one of five working groups to help the state implement its new higher education plan. Reggie will co-chair the working group on Student Success along with Stockton University President Harvey Kesselman. New Jersey Governor Phil Murphy and Secretary of Higher Education Zakiya Smith Ellis unveiled the expansive statewide higher education plan at Rutgers University-Newark on March 26th. Known as “Where Opportunity Meets Innovation: A Student-Centered Vision for New Jersey Higher Education,” the plan will ensure every student will have the opportunity to obtain a high quality education that prepares them for life after college. “I am truly honored to be part of such a historic moment for New Jersey. It has always been our firm belief at NCLC that every student should have the adequate preparation, information, and resources needed to succeed in college or another post-high school option. I am excited to bring the expertise of NCLC and its partners to this important statewide initiative,” said Reggie. The other four working groups are focused on (1) Creating On-ramps to College, (2) Safe and Inclusive Learning Environments, (3) Research, Innovation, and Talent, and (4) Making College Affordable, which will be co-chaired by Rutgers University-Newark Chancellor Nancy Cantor. For more information on the statewide higher education plan, click here.